During May–June, 2013, the U.S. Geological Survey, in cooperation with Park County, Colorado, drilled and installed four groundwater monitoring wells in areas identified as needing new wells to provide adequate spatial coverage for monitoring water quality in the South Park basin. Lithologic logs and well-construction reports were prepared for each well, and wells were developed after drilling to remove mud and foreign material to provide for good hydraulic connection between the well and aquifer. Slug tests were performed to estimate hydraulic-conductivity values for aquifer materials in the screened interval of each well, and groundwater samples were collected from each well for analysis of major inorganic constituents, trace metals, nutrients, dissolved organic carbon, volatile organic compounds, ethane, methane, and radon. Documentation of lithologic logs, well construction, well development, slug testing, and groundwater sampling are presented in this report. 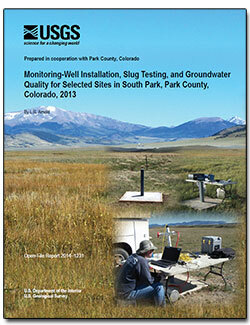 Arnold, L.R., 2015, Monitoring-well installation, slug testing, and groundwater quality for selected sites in South Park, Park County, Colorado, 2013: U.S. Geological Survey Open-File Report 2014–1231, 32 p., https://dx.doi.org/10.3133/ofr20141231.